Jekyll Island .. cool place on Georgia’s Coast. Once the private playground of the rich and famous, now for $3 you can come and play too. I did 5 sleeps exploring the island’s beaches, trails and historical area, as well as the surrounding coast. 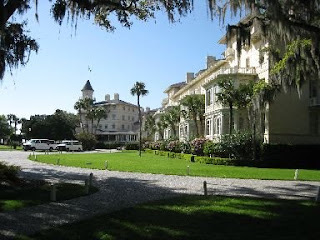 I loved the huge moss draped live oak trees, quiet beaches and old mansions in the historical area. Though I was there on a holiday when the campground and picnic areas were packed, I was able over and over again to find solace on the beaches and trails. The Wildbirds Unlimited store was able to direct me to a rookery behind the old amphitheater where I found dozens of nesting Wood Storks and Egrets. The historical area where the Rockefeller, Morgan and Vanderbilt’s all built homes is a fabulous place for a stroll. Now the homes are either shops or hotels. There are nice wide bike paths that can get you almost anyplace on the island. A pedalers dream. Dog & I opted for strolls instead to do some birding and watch the fabulous sunsets. We stayed at Blythe Island Regional Park and at Jekyll Island Campground. Blythe Island was very nice. Decent sized lots, lots of trails, little lakes and friendly staff, all about 10 miles from Jekyll. Jekyll Island Campground was not my favorite. It has lots of trees, tighter spots, lots of sap, utilities questionably placed and very young staff. What it lacks in the way it is set-up it does make up in location, especially if you want to bike the island. I would stay at both campgrounds again. St. Simons Island is Jekyll’s big populated brother to the north. It has a lighthouse, with a touristy area, and lots of crowded beaches. The city of Brunswick has a nice downtown area but it was quite empty when I was there. In fact the whole town seemed empty. I had me wondering if a bomb had exploded or the rapture occurred it was so empty. I actually think all the Brunswick folks were at the beaches in St. Simon that day. 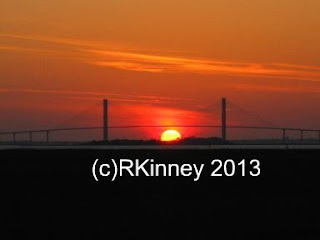 I found Jekyll Island a great place to relax and enjoy the beauty. Today as I sat alone in a family restaurant on the North Carolina coast, debating the merits of the rib special with another diner, I was reminded of my first experience dining alone on the road. It was in a one stop town in Nebraska on a Saturday morning. A group of older men were drinking their coffee's and wagging their tongues on all the town gossip. Kind of reminded me of a beauty shop except these guys didn't seem to have much hair under their John Deere hats. I was a little nervous being the lone outsider at first, but then I settled in. I enjoyed getting the 'picture' of their town through their interactions and conversations just as much as I did the eggs and ham. I was on this journey through Nebraska because my friend and I had planned a 3 weeks trip to travel through the the Northwest. I was in Colorado. She was in California. The plan was for me to go get her, then we would head north and work our way back to Denver. This was pre RV days. Our plan was to tent with a motel thrown in here and there. I found out a few weeks before I was scheduled to leave that she couldn't make it and was terribly bummed out that we had to cancel the trip. After all who in their right mind would take a trip by their self .. on purpose? I had always vacationed with family or friends, after all that's what you are suppose to do right?? Then, while on a business trip to Missouri 2 weeks prior to my vacation, I heard a gal speak at an AA meeting. I think her name was Gwen. She was about my age and had just gotten back from a solo camping trip out in Wyoming. "You did what?! ", I questioned her after the meeting, "You just took a trip by yourself? On purpose? Weren't you scared? Bored?". I had a ton of questions, since I had never even contemplated such a thing. I could not shake thinking about what this gal had done and 'lived to tell about'. As I traveled back to Denver, I decided that if she could do it then I could do it too. I called my friend in California and told her that I was still gonna do the trip. I would do it in reverse order and pick her up in the end and she could travel back to Denver with me. She thought I was nuts. I thought I was nuts, but I set out nonetheless. Map, sleeping bag, cooler and tent all in tow ... ready to stretch my horizons. Or at least spend a weekend out of town in a Motel and come up with a good excuse for my friends why I couldn't continue the trip ... I could find some way to save face rather than admit I was too scared to stay in a tent by myself if need be. That was not necessary. After a couple of tossing and turning nights staying awake, I was so tired that I slept fine and an axe murder did not get me. I went to Sturgis, discovered Banff, Vancouver Island, the Oregon Coast and much in between. I meet other people traveling alone from all over the world. I shared a table on separate occasions with a gal from Britain and a Canadian Mountie from Ontario just so we could get in a restaurant quicker. I meet people in campgrounds, on tours and in restaurant lines. I was not at all lonely. Being by myself actually gave me more opportunity to meet people. It was a fabulous trip. What I didn't know was that this trip would lay the groundwork for me being able to travel as I do now. It was only a three week trip but the experience broadened my horizons immensely. It helped me think about travel differently and ultimately played a part in me being able to take the plunge into the RV lifestyle. Funny how life has a way of preparing us for life..
A freaky dream had me up at sunset and ready to move on. A birder suggested Florida's St. George Island as a 'do not miss' place to bird. My 'friend' June, suggested that Destin was a place that I needed to drive through and see. So I set out from Gulf Shores, AL south on US 98 which goes through Destin against my gut feeling which said take the interstate & drop down. I assumed my 'friend' would not steer me wrong. Destin was beautiful driving into .. white sand, beautiful water, marina's the whole bit .. then you get into the city .. it's spring break, it takes 3 changes to make it through a light. I can put the rig in park, get up & get myself a drink, then a snack, then Trailer Life .. the traffic was horrid. It was horrid through Panama city. It took 8 hours to go approximately 230 miles! It was awful and I was ready to bail out of Florida and head west. I tried to envision driving in Utah as I sat through light after light ... wide open spaces, pretty red rocks, and not a vehicle on the horizon. I turned on Classical music to calm myself as I had to brake yet again. Not a pleasant drive, but I am glad that I did not give up and head west. Once I hit Mexico Beach, everything changed. The traffic was gone, I began to see pine trees, the towns were small, the beaches uncrowded, there were signs for bears and not a high rise in sight. I almost thought I was someplace out west. Who knew Florida had bears and really tall pine trees? This was a different world than the craziness of Destin and I was happy for the change. 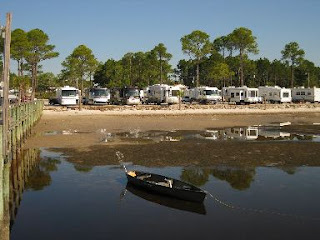 The island campground had been full, so I ended up about 25 miles further down the coast outside the town of Carrabelle at Ho Hum Rv park, a small park along a quiet stretch of waterfront. If you aren't on the water, the sites are a bit tight and just sand but with wifi and cable. The beach here was not huge, there are not waves crashing in and the water is brown instead of the pretty blue by Destin. It's just a calm strip with plenty of water birds and waders hanging out. I drove back to St. George Island the next day to check out the birds. A front was coming through and it was very cold and windy. Birding was not great and I had to wear gloves to hold my binoculars. (There were kids on the beach in swimming suits!) The island has nice beaches, vacation homes and a lighthouse. 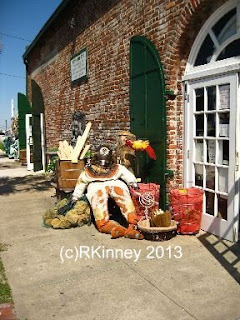 By afternoon, it warmed up and I headed to Apalachicola, an interesting town about 9 miles from the island. I found this to be a refreshing little town. I get tired of little tourist towns that all have the same stores with the same tourist stuff. Apalachicola had a little of that but for the most part it was unique items from local artist. The Malt shop was getting rave reviews from passerby's, as was the chocolate store .. I stuck to my guns and just had a piece of salt water taffy .. okay so I had two. Oysters are a big deal in this area. In fact, 90 % of the oysters from Florida are suppose to come from this area. There are mounds of oyster shells in this town. I did not partake of the local seafood but my fellow campers said it was excellent. The whole Forgotten Coast area looked interesting and begged discovery, though I could only get a space for 2 nights. The area deemed the Forgotten Coast runs from Mexico beach south to Carrabelle. Mellow, uncrowded, lots of places to bird and hike, good food, not a bad place to hang for a while. This is an area I would definitely like to return and spend more time though I won't be taking Hwy 98 through Destin to get there! I headed into Mobile, Alabama ... the big boats, sky scrapers, and battleship tried to woo me but the water lapping at the stop sign at the bottom of the exit ramp keep me moving. Next time. 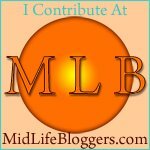 I headed to Gulf Shores to see if I could connect with road buddies I hadn't seen for a while. We did at Gulf State Park where they were spending their second winter. Gulf State park is a big park, has a campground, 2 lakes, golf course, many walking and biking trails and multiple places to access the beautiful white sand beach. It has been rebuilt since being hit by Hurricane Ivan in 2004. Many of the park and area trees have been wiped out. It is still a neat place. I had considered staying at Dauphin Island Campground to have easy access to the Audubon Bird Sanctuary adjacent to it before catching up with my friends but had skipped it. Dauphin Island is one island to the east of Gulf Shores. I still wanted to check out the Sanctuary so I caught the Mobile Bay Ferry between Fort Morgan and the island. This is about a 40 minute ride across Mobile Bay. (You can take RV's on the ferry.) I chose the cheap route ($5 rt) and walked on with my bike. I saw lots of sea birds, lots of oil rigs and lots of interesting people on the ferry. I took a chance and approached a couple with safari hats, cargo pants and binoculars also on bikes hoping they might be birders. My hunch bore out and I scored up to date info on what birds were where on the island. I headed to Shell Mounds instead of the sanctuary and saw some good birds and made some new friends. I toured the Campground before heading back and decided I had made a good choice on my campground at the State park. Gulf Shores is a tourist area. It has high rise hotels along the beach, all the restaurants and souvenir shops you find at any other beautiful beach. The State Park offers some buffer from this but you an see the high rise hotels from the Park. Still at night the park was quiet with a chorus of frogs singing their hearts out. The people I met here where extremely friendly. I was on the move again after three sleeps, but could have easily stayed a month and not been bored. There is plenty that I did not do or see here this trip. There were several birding sites on Dauphin, between Fort Morgan and Gulf Shores and between Gulf Shores and the Florida line that I did not get to. I do hope to return. Well, it was hard to head east from New Orleans. I could have headed north to the 'land of familiar' and watched my youngest niece do her first Easter egg hunt. I was torn, resisted and headed for new territory .. I hope she will understand when she's older. As I headed east out of New Orleans I finally started to really see Katrina's destruction for the first time. Shingles hanging off roofs and piles of debris were still there .. almost five later. Amazing. I headed out in the midst of severe flooding throughout the Southeast. Roads, parks, campgrounds were closed and flooded. The night before on the news they showed a campground on the Louisiana/Mississippi border with water halfway up the side of a 5th wheel. That got my attention! I had wanted to experience Biloxi but the closure signs, swollen rivers and the air force jets scaring the beejeebers out of dog & I as we stopped to contemplate the matter keep me moving. As we went on, I keep noticing people pulled off the highway .. not on the shoulder but on the grass beyond that. There were lots of cars spread out. I looked closer. There were people fishing! ... right off the interstate! I-10 a fishing hole .. who knew. I had never seen people fishing along a interstate .. one guy had either a big gator or a big turtle. It was hard to tell at 65 mph. You don't see that everywhere. Driving along the coast, I have seen lots of things that you don't in the west and midwest where I have spent most of my life. Causeways, bridges, bayous, swamps, evacuation signs, pastel colored houses on stilts, fish markets, boats, boats and more boats all novel as I headed up the coast from Texas. Now I get that is just life along the coast. But fishing off the interstate?? The sun is setting on a day I wish wouldn't end here in SE Louisiana. I down my last handful of Mulberries picked on the boardwalk at Bayou Segnette State park, where I have spent the last couple weeks. It's a beautiful evening in the park. I think I am beginning to like adventuring along the coast. Maybe its the Mulberry trees loaded with berries that remind me of sitting in a tree eating hundreds in a day when I was a kid. Maybe its just that this is a cool place. Bayou Segnette is 18 minutes driving distance from the New Orleans French Quarter yet worlds apart from it. The city of New Orleans, particularly the French Quarter is something everyone should experience at least once. Stroll the flowered balcony lined streets. Enjoy the live music from the clubs or the street corners. Have a beignet at Cafe du Monde, try a muffuletta, etouffee and don't miss the double chocolate bread pudding at the Red Fish Grill on Bourbon Street. 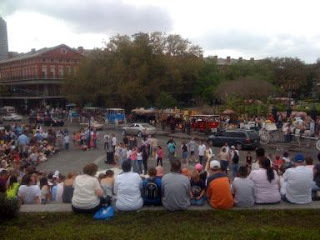 Cruise St. Charles avenue, tour the many famous cemeteries, ride the street car down Canal street, there is plenty to see and do in the city. What many people don't realize that there is plenty to see outside of the city as well. Opportunities to fish abound in the local lakes, rivers and bayou's that are pretty much everywhere. We had a deluge of rain that flooded the campground ... water birds were fishing outside my door, I am guessing I could have too! West of the Mississippi, where Bayou Segnette is located, you can find several swamp tours and fish markets. I enjoyed looking around at the Westwego Fish market but couldn't bring myself to buy critters with there heads still on or in the case of the crawfish and crabs, critters that were still alive. I pulled in today to let a vender know that one of his crabs had escaped and was headed for traffic! I am not sure if boiling is any better than being squished, but I thought it was the right thing to do at the time. The near by, Perrino's, had a interesting fish market where you could get fresh fried shrimp and homemade bread pudding. Jean Lafitte Preserve I found fascinating. 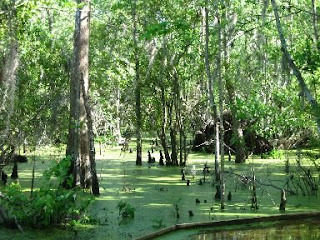 I loved all the sights and sounds of the swamp. Birds, Gators, snakes, frogs, and dragon flies among the moss draped trees. Eerily cool. There are opportunities to kayak or canoe the preserve as well. There is much more here that I would like to see and do but I have reached this parks limit so I must move on. After experiencing this park, with its nice sized sites, wifi, free laundry, abundance of water birds, mulberries and proximity to all the the places I like to go for a reasonable price .. it would be hard to stay anyplace else. I am already looking forward to my next visit. What's that Mr. Ranger? You aren't suppose to pick the berries? Oh those berry stains on my fingers are from cleaning them off my shoe. What, I have some on my mouth? Ur.. um.. Yeah I think it spurted when I stepped on it .. Yeah that's it... that's more story and I am sticking to it.